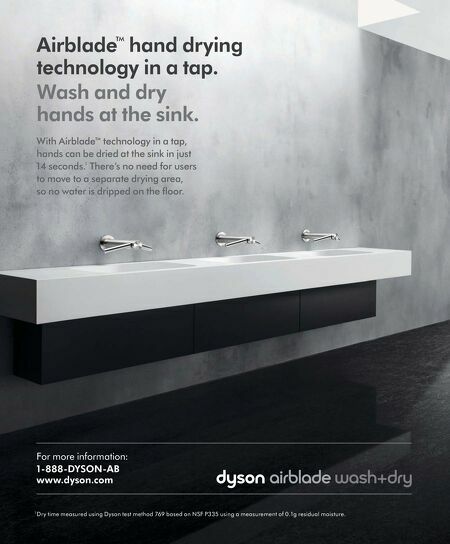 Airblade™ hand drying technology in a tap. Wash and dry hands at the sink. With Airblade™ technology in a tap, hands can be dried at the sink in just 14 seconds.1 There's no need for users to move to a separate drying area, so no water is dripped on the floor. For more information: 1-888-DYSON-AB www.dyson.com 1 Dry time measured using Dyson test method 769 based on NSF P335 using a measurement of 0.1g residual moisture.